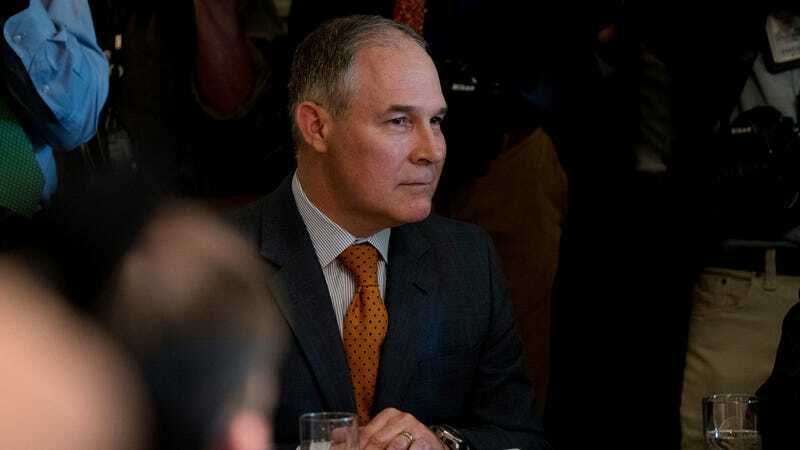 The researchers behind an upcoming 600-page federal report on the state of climate change science are very, very concerned Scott Pruitt, the new Environmental Protection Agency chief who made his national name attacking the EPA, is posed to destroy it. According to Nature, the scientific report is a precursor to the legally mandated fourth National Climate Assessment in 2018. It is all but finished except for final sign-off by 13 agencies including Pruitt’s EPA, and Pruitt has proposed requiring future climate research pass a “red team, blue team” panel. The red part of any such panel would include “dissenting” voices—and the pool of dissenting scientists is in large part funded by climate change-stoking industries like coal mining and fossil fuel extraction. According to Nature, Pruitt appears to be making preparations to move forward with the red team, blue team panel idea, and documents forwarded by an EPA official show he has consulted with the Heartland Institute, a fossil fuel lobbying group, on who to put on the red side. Pruitt slashed half of the scientists from the EPA’s board of scientific counselors this year, opening the way for fossil fuel lobbyists and paid flacks to muscle their way in. Even without naked interference from Pruitt or other federal officials, Trump has left major vacancies at the White House Office of Science and Technology Policy, which coordinates climate reports. The OSTP’s entire science division had no employees left as of July 1, and its staffing in general plummeted from 130 staff under Barack Obama to just 35 in early July. Pruitt has no formal scientific qualifications. Before being appointed head of the EPA, he was best known for repeatedly suing the agency in his role as Oklahoma’s attorney general. Trump himself has repeatedly referred to climate change as a Chinese “hoax,” and on dozens of occasions has tweeted that cold weather disproves climate science. He also has a penchant for not really caring about the consequences of warring with the judiciary, so he will probably not care all that much about interfering with the legally mandated 2018 climate assessment.